We Have No Control Over Ads. These Are Ads Put On By WordPress. Pill Containers as daily living aids made better. 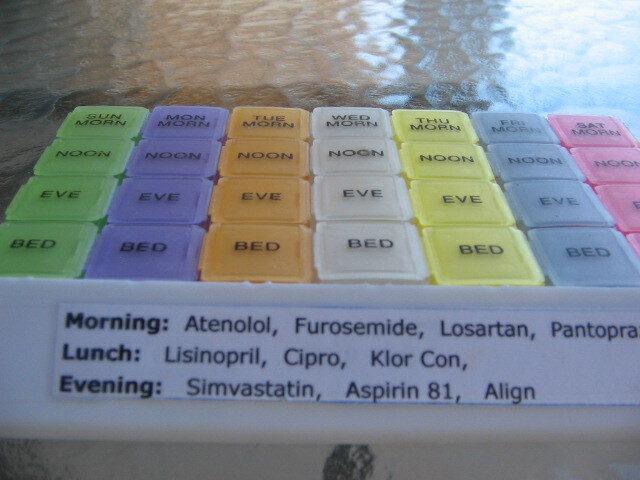 Many people use a daily living aid like a plastic pill container to make remembering the medications to be taken easier. I take care of my 92 year old mother’s pill containers and I typed out the time of day using Morning, Lunch and Evening and the medications for those times of day. This makes it much easier for my mother or most elderly people to know exactly what is in each section of their pill container. Additionally, this also helps visiting nurses or therapists that may come to the home to know what the patient is taking. Also, if there is an emergency, you can grab the pill container and take it with you to the hospital. This just gives additional information, but make sure the font is large enough for those with low vision and it is kept updated and current. Just type the information on a piece of paper, cut to size, and then tape to the front of the pill container. 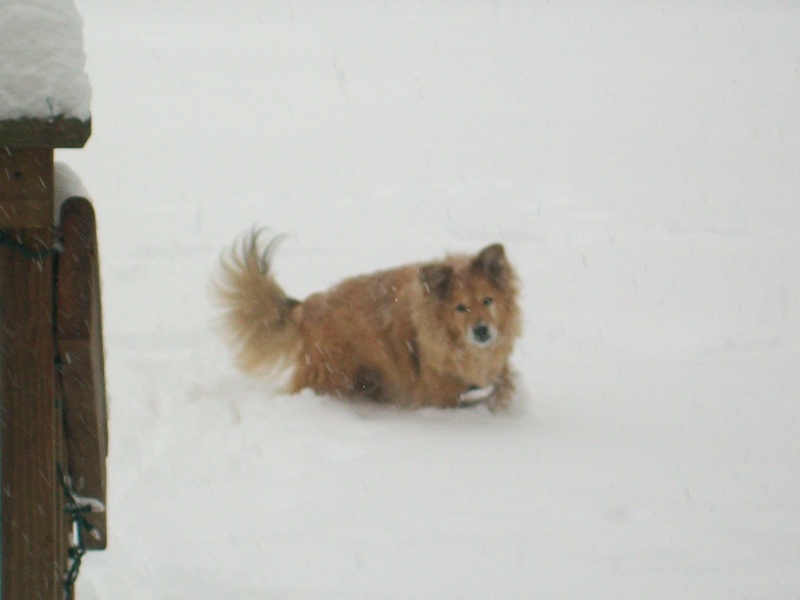 Don’t forget your pets in a snow emergency! Don’t forget your older seniors and elderly family members when a winter storm is predicted, especially when the weather bureau is saying words like “epic” and “historic” and “major”. There isn’t always a lot of time to prepare, but if you have teenagers of driving age in the family they can help out too. Send them off to grandma/grandpa’s house with a list of things to do if you don’t have the time. First of all major snow storms often cause electric outages. The main problem here is that in general, the elderly need to stay warmer, usually they shouldn’t let their home fall below 70 degrees. Their bodies just can’t adjust to temperatures like they used to when younger and they can very quickly develop Hypothermia, a serious medical condition. So, what do you do when the power outages are predicted? 1. Make sure they have heavy blankets, especially down covers because they provide a lot of warmth without a lot of weight. Make sure the down or other heavy blankets are NOT on a high shelf requiring them to get on a chair or ladder to retrieve them. Get them down for them and put them on the bed. 2. The body loses heat through the head, and lots of elderly heads have lost quite a bit of hair as well so there isn’t much protection there. It would be helpful to give them a ski cap type of head covering to wear in the house and to bed to keep their body warmth in. 3. If they have cell phones and cordless phones, make sure they are on the charger and getting fully charged. Today we have additional chargers for cell phones that can be kept in a pocket or purse for extra power as needed. Make sure it is fully charged up. If the electricity is out for several days, the cell phone and cordless phone could run down as well. These chargers can be purchased at most big box stores for as little as $15.00 in many areas – great for weather emergencies. This is the time when some people might wish they had a land-line phone, because their electricity comes from the telephone lines and they don’t have to be charged. 4. Flashlights and extra batteries – make sure the flashlight works and there are plenty of fresh batteries. 5. Water – make sure they have several gallons of water on hand. If laundry is piling up get it done before the electricity is lost. 6. Food – choose foods that don’t have to be cooked. Have tuna on hand, crackers, bread, peanut butter, fruit, raw carrots, canned milk, Carnation instant milk (or other brands) cans of Ensure or other similar drinks, dry cereals, granola bars, breakfast bars, bagels for example. 7. Make sure they have enough of their prescription medications on hand – if they run out they may not be able to get to a pharmacy during a winter storm emergency. Make sure they also have baby aspirin, just in case there are symptoms of a heart attack and their doctor tells them to take it while waiting for an emergency vehicle, and it could be a long wait in a storm emergency. 8. Take a look around for trip hazards in the home, you definitely don’t want a fall to occur. Snow emergencies are a bad time to need an ambulance, and difficult for family members to come over to provide assistance. 9. If possible elderly family members might be better off staying with family members for their own safety during a severe snow emergency. The ability to use a telephone is one of the things that we notice quickly and with apprehension with people starting with dementia. Cordless phones with the myriad of buttons and abstract symbols because very confusing, even turning the phone on or off can become a problem. What does the family do? It depends on the level of dementia. In the earliest stages an easy to use phone can solve the problem, but as more memory loss occurs a dial by picture phone accessory may be the answer. It can be fun and easy for the family member with dementia. The FotoDialer Dial by Pictures connects to your telephone easily. Then you insert photos of those people called the most often. We usually recommend photos of people at a younger stage of their life, as this is helpful for those with Alzheimer’s and dementia who may remember the past better than the current time. You can also use the photo of a policeman, firetruck, doctor, dentist or pharmacist, do it your way, depending on your individual need. Then you just press the button next to the photo of the person or place you want to call and pick up the receiver and talk. The Dial by Pictures telephone accessory is also handy for anyone with low vision since the photo size is 2″ by 3″ (wallet size). Children use this too, allowing them to make calls easily to family. 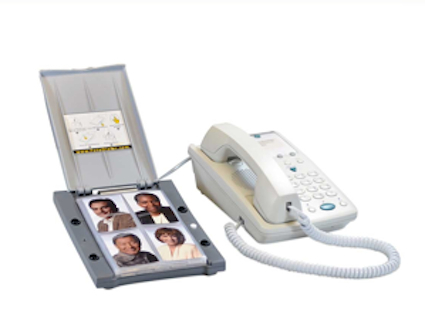 Modern Senior Product offers the HC-FOTODIALER under our Telephone Accessories Category. Help your memory impaired family members continue to live independently as long as possible, remain connected to family and friends and reduce isolation. This low vision accessory holds up to 24 programmable numbers using the photos for easy recognition. 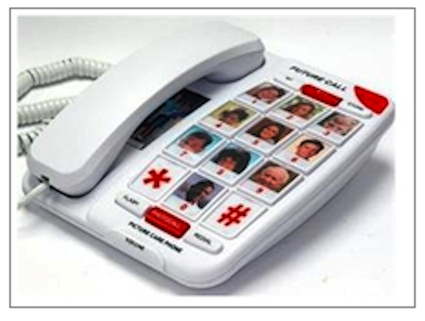 The FotoDialer dial by pictures can be used in most nursing homes, assisted living facilities and the home environment. It also reduces the need for the a caregiver to place telephone calls, when they can do it themselves and continue to feel that they can still do some things for themselves. Photo Memory Phones – A Good Choice For Dementia Patients? Difficulty using the telephone can be an early sign of mild cognitive impairment or early Dementia. Today’s telephones are more difficult to use than in days gone by as society is increasingly relying on technology for every day living whether using a coffee pot, a telephone or alarm clock. Have you noticed these problems when your family member uses the phone? What can you do to help prevent isolation, inability to communicate and depression when the person with dementia can’t reliably make a phone or receive a phone call anymore? How will they stay connected to family and friends? You will need to choose a different kind of phone that uses photos or pictures to jog the memory. The mind remembers what a person looks like longer than it can remember a string of numbers or what the symbol of a red phone means. The photo memory phone is ideal for this need. You insert a small photograph of the person on their short call list, children, grandchildren, doctors, best friend for example. It may also be better to use a little younger photograph than the way the family member looks like now, as the mind seems to remember people that way longer. If you don’t have a photo of the doctor, you could just write the word doctor for example, but avoid using a medical symbol for a doctor. If the family member with cognitive impairment or dementia is calling 911 and you don’t want them calling 911 without good reason, you can usually program the photo memory phone’s 911 emergency button to call another number, such as a family member. If the phone is going to be used in a nursing home or assisted living setting again, you can program the 911 button to call a particular family member or not to call anyone. Memory photo phones can be superior to a regular phone with numbered buttons because the number buttons are all the same size and color, causing confusion. You will want to reduce the number of visual similarities as object perception is a problem for those with cognitive impairment. When looking to purchase a photo memory phone it is best to find a phone with the least buttons to help prevent confusion, and to only purchase a phone with the least number of features. It should be extremely simple. Then once you get the phone enroll the telephone number in the National Do Not Call List to help prevent fraudulent/scam calls as seniors/elderly are more prone to being scammed. Typically when using a photo memory phone you would just pick up the handset and push the photo of the person you want to call – no numbers to remember, no memory buttons. The simpler the better. Swallowing Disorders, Dysphagia – Do Drinking Aids Help? nervous system to cooperate. If a person has had a stroke, the throat may be affected and they only be able to take small sips without choking. When you eat or drink the substance goes down the esophagus to the stomach, if you swallow “wrong” it may go down the trachea into the lungs causing aspiration pneumonia, a dangerous situation. Swallowing difficulties, also called Dysphagia may be caused by several medical conditions including stroke, Alzheimer’s Disease, Parkinson’s Disease, Cerebral Palsy, ALS and after chemotherapy. Research indicates that Dysphagia has been underestimated in neuromuscular disorders. Alzheimer’s patients may ultimately develop swallowing difficulties, and may even forget to swallow. Some Alzheimer’s patients have been known to hold the fluid in their mouths because they have forgotten that they need to swallow. In this instance, it is suggested by some authorities that the Alzheimer’s patient should be told to swallow after taking a sip and needs to be monitored carefully by the caregiver. Dysphagia is common after a stroke, it occurs in up to 65 percent of stroke victims. Normally when a person feels something going down “the wrong way” they will have a very strong coughing spell, but stroke victims often lose this feeling and ability to cough. Thin liquids can be very difficult for the stroke victim with Dysphagia as thin liquids move quickly through the mouth, and there isn’t enough time to allow the sequence of events of the voice box to lift, close and then to move forward to protect the individual’s airway, making it difficult to swallow safely. The above medical conditions may necessitate the need for special drinking aids and feeding aids for Dysphagia, or even feeding tubes. It is estimated by researchers that up to 52 percent of Parkinson’s patients eventually end up with some amount of Dysphagia, resulting in aspiration pneumonia, dehydration or malnourishment. Motor swallowing exercises may help promote not only maintenance of the ability to swallow, but also improvement of the patient’s oral function in the independent elderly with Parkinson’s Disease. These swallowing exercises are specifically designed to increase the strength and the range of the patient’s mouth, larynx and pharyngeal structures. Ask your doctor about Dysphagia drinking aid cups when there is the danger of aspiration pneumonia or choking when drinking thin liquids. There are cups that give out a measurement of 5cc (1 teaspoon) or 10cc (2 teaspoons) of thin fluid with each drinking motion and are angled to allow proper chin position. These special needs drinking aids may allow the patient more independence, better hydration and nutrition. The doctor should be able to tell you if these would be right for the medical condition under discussion. This article is not meant as medical advice, it is informational only. 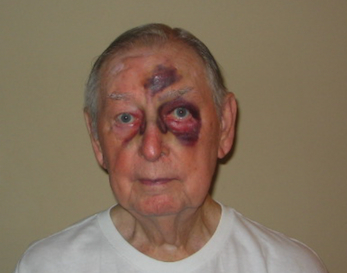 Always contact your physician before starting anything new when under a physician’s care. My first suggestion is to be sure the bed is large enough. Back in the day, 30 to 40 years ago, the full size or standard size bed was the customary size for couples, however, the full size bed gives each person about 27 inches of sleeping space, equivalent to sleeping on a baby crib mattress. The full size bed measures 54” by 75”. The queen size, the next step up, on the other hand, measures 60” by 80”. Today, most hotels use queen or king size beds for the comfort of their patrons. If a person sleeps on a very small bed, or has medical conditions such as mentioned above, I recommend either purchasing a larger bed or buy small safety bed rails for adults. Many of these safety bed rails are also portable and may be used when visiting and staying at a relative’s or friend’s home, or when at a hotel. Next, consider the emergency phone call at night. If the person is hearing impaired, they will remove the hearing aid when going to bed. When a call comes in, or they need to call 911 for example, they will be using the phone without the assistance of the hearing aid. In this case it is a good idea to have an easy to use and understand amplified phone next to the bed so they can hear medical personnel and follow necessary directions. Motion sensitive night lights are very useful for the bathroom or near the bathroom door. This will help prevent tripping over anything on the floor. Also, a regular nightlight that you turn on and off can be useful for safely lighting the way to the bathroom. If the individual has GURD, also known as Acid Reflux Disease, consider using either two pillows for sleep or purchase a special acid reflux pillow that raises the head sufficiently to help prevent GURD. Chronic Acid Reflux over a period of time can cause damage to the esophagus, making surgery sometimes necessary. Make sure the bedspread or bed linens/blankets aren’t hanging onto the floor causing a trip hazard too. Inspect the area going to the bathroom, and to the bedroom door – make sure these areas are open enough to allow safe movement. If the person has a significant fall risk, consider safety hand rails on the walls. Use a Wander Alarm or similar device to notify others in the home if the bedroom occupant has Alzheimer’s and tends to have Sundowning Syndrome, meaning they wander during the night, leaving the bedroom and causing a potential dangerous situation. The Wander Alarm emits an alarm if the person opens the door. Posted in Alzheimer's Disease, Cognitive and Memory, Medical Conditions, Medications, Uncategorized. What Does TIA Compliant Phone Mean? In the past, hearing aid wearers had interference problems when using digital cordless telep hones. A cordless phone has a wireless handset that communicates with the base station by radio waves. The base is plugged into the telephone line jack and the phone is powered by an ac adapter. Many of the cordless phones are expandable, meaning they have additional handsets that will “talk” to the base unit and they can be placed around the home or office without needing a telephone jack. Even though the best quality sound still comes from a corded telephone, cordless phones have improved greatly and have proven convenient for many people. Interference issues cropped up with the cordless digital phones, as they can cause interference with hearing aids – creating an audible buzz. The older type analog hearing aids are even more affected by cordless phones than the newer digital hearing aids. The TIA-1083 is a newer telephone standard that was developed by the Telecommunications Industry Association (TIA) and Gallaudet University, Entymotic Research and Motorola to help solve the problem of the electromagnetic fields that are created by the handset that causes cordless phone interference with hearing aids. A telephone complies with TIA-1083 if it meets the requirements of the new standard. Meeting this standard means that hearing aid users will have significantly reduced interference when using their TIA Compliant cordless phone, making their conversations higher quality with less static or buzz. TIA-1083 Compliant is a higher standard for cordless phones than just being hearing aid compatible. 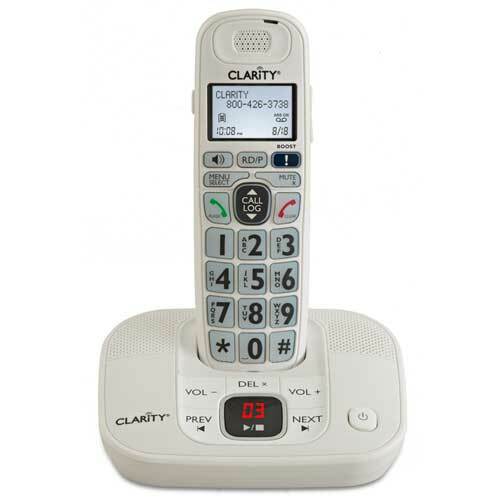 This standard applies to cordless phones and is especially important when purchasing cordless phones for seniors, as many seniors wear hearing aids. Doctor – Is This Arthritis? Bet you’ve never heard of Dupuytren’s contracture. You might think that curving finger you have is osteoarthritis, but it could be Dupuytren’s contracture. This condition is a type of fibromatosis that causes a shortening and thickening of the fibrous tissue in the hand. In this condition, a knot of tissue forms under the skin of the palm, then a taunt cord forms which pulls the finger toward the palm. This condition can come on gradually over many years and progress to the point where the finger is pulled back all the way to the palm, or its progress may be quick and then it can also stop. This condition is usually painless, with just some sensitivity with touch. "Copyright 2009, WebMD, LLC. All rights reserved." Dupuytren’s contracture can occur in both hands, but usually one hand is affected more than the other. Men are usually more affected then women. This condition can make daily activities more difficult. Putting on gloves, putting the hands in the pockets, or putting the hands into a purse to retrieve an item can be difficult and it can affect your ability to open your hand fully and to grasp large objects, it can also make writing and shaking hands awkward, and causes difficulty with face washing and combing the hair. Typing would also be difficult. How do you know if you have Dupuytren’s contracture? Ask your doctor. Usually tests aren’t necessary, the doctor will probably have you put your palm on a table top and see if it can lay flat, if you can’t lay your palm flat you may have Dupuytren’s contracture. Often times you will see the thick knot of tissue under the skin of your palm, and the cord in the palm may actually protrude and be easily seen and may actually go up your affected finger, but this is in more severe cases. This cord tightens and pulls the finger down. Some studies suggest that Dupuytren’s contracture may be associated with cigarette smoking, epilepsy, diabetes and genetics. 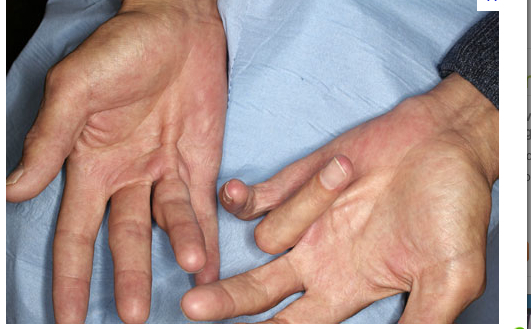 If you have this condition, it is a good idea to stretch your fingers. Place your fingers on the edge of a table, placing your palm down, and then slowly lift the palm upward while keeping your fingers flat on the table. You will feel the stretch when done correctly. For an even better stretch, warm your hands first with a microwavable heat pack and massage your palms. There are a number of options for treatment including needling, enzyme injections, surgery , INF gamma & shockwave therapy and radiotherapy.